Chatbots can increase contact center efficiency and free agents to focus on complex interactions. The universal answer to the above question these days seems to be an emphatic “yes!” Business leaders are recognizing that customer experience is a competitive business differentiator. Unfortunately, the complexity of omnichannel customer experience objectives have challenged even the highest performing companies. Contact center leaders are critical to executing on the organization’s mission and brand promises. It’s now time to step in to drive these strategic initiatives. I recently spoke at the CCW 2017 conference in Berlin, the biggest contact center event in Europe with over 7,500 attendees. The conference had tremendous vendor participation. Attendees were hungry for new technology solutions, but one technology grabbed the spotlight: chatbots. A chatbot is a software program that can simulate human conversation in chat interactions using artificial intelligence to respond to FAQs, requests for information, etc. Chatbots are not necessarily a new concept, but with artificial intelligence technology now advancing at warp speed, they are evolving into a viable, efficient means of communication between companies and their customers. Natural language processing (NLP) technology enables the chatbot to understand and interpret what is being communicated, even when it is imprecisely stated. Machine learning (ML) technology enables chatbots to continuously expand their knowledge and accuracy as they learn by experience and enhanced data sources. Similar to the way search engines work, the chatbot will crawl all available data sources, including customer accounts, product information, FAQs, core platforms, etc. When any information is updated, the chatbot updates its knowledge-base making it self-sufficient. It goes without saying that information updates must be carefully curated. What Can a Chatbot Do for Your Contact Center? Chatbots have enormous potential to increase contact center efficiency. Their ability to process complex data far surpasses even the best subject-matter expert capabilities. They can handle common, mundane type customer chats quickly with consistent quality output, which can free your live agents to handle the more emotional interactions that are not well-suited to chatbots… not yet, anyway. On top of that, chatbots are on duty 24/7 (they don’t require breaks, call in sick or take vacations). Chatbots need to be trained. Like employees, chatbots need to be trained to be effective and productive. Interfaces to your sources of knowledge, data and other types of intelligence are required. If you have done a good job with knowledge management, you will have a definite advantage. If you’re sheepishly admitting that knowledge management has not been one of your shining accomplishments, there’s a silver lining. You’ll need to invest some blood, sweat and maybe a few tears, but chatbots can bridge the knowledge divide faster than you can catch up on years of KM neglect. What if the chatbot doesn’t know the answer? This will happen frequently in the early phases while the chatbot is amassing knowledge. When it is unable to respond, the chatbot will forward the customer to a live agent, along with the chat history, for continued response. The chat interaction would be logged in the contact center platform and accessible to the chatbot when needed in the future. Chatbots can make a big impact now, and as artificial intelligence evolves, your organization should be poised to evolve with it. Educate yourself and your team by researching the technology, vendors and user reviews. —Reduce need for agent-assisted interactions by X%. —Improve service levels on agent-assisted interactions by X%. —Increase in sales revenue by X%. Engage with IT and other internal partners. —What is the design and implementation project plan? —What internal resources will be required? —What is the level of effort? Will they be dedicated resources? —What data and information sources need to be accessed? —What are the prerequisites to integrating the data sources to chatbot? —What is the rollout process? Will it be phased? Check references and network with centers that have implemented chatbots. —Identify FAQs that can be readily handled by the chatbot. —Provide product information such as dimensions, weight, shipping costs, etc. —Order, refund and shipping statuses. —Providing links to sources of information. Determine what ongoing support and maintenance resources are required to support the chatbot. Before you begin, set realistic expectations. Some vendors will tell you it’s going to be fast, cheap and easy to install their solution, but beware and do your due diligence. There’s a good chance chatbots will be worth the investment and will provide a fairly quick ROI if you invest the resources to roll them out properly and provide your bot with ongoing care. Contact centers are complex business ecosystems where all elements are interdependent. The failure of one element will impact the health and performance of the ecosystem as a whole. Given this, it’s important to make an educated decision. 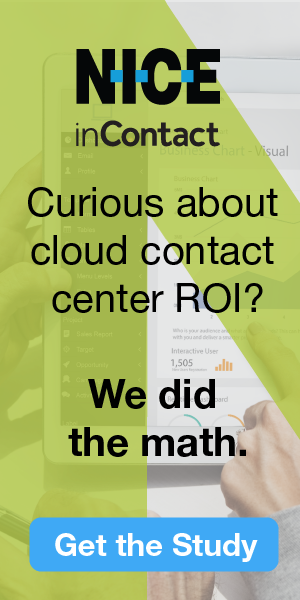 Marilyn Saulnier is the Director of Global Contact Center Consulting at Genesys |Interactive Intelligence. Can AI Replace the Call Center’s Human Agents?